Dave and I took a drive on Saturday. It’s something we hadn’t done in YEARS — as the kids get older they don’t really have the patience to just sit in the car and enjoy the scenery. We got into the Mustang, put the top down and headed eastward! Much of what I had written about Florida recently has been in areas around Pensacola and Destin. 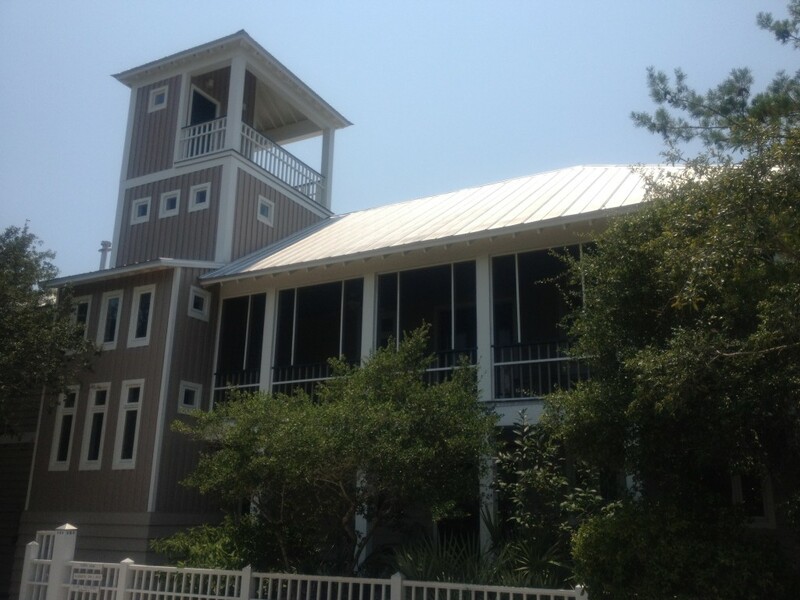 Unfortunately, there is so much congestion in Destin, we rarely get to go east. Of note along Highway 30A is the town of Seaside, made famous by the 1998 film The Truman Show with Jim Carrey and Laura Linney. The made-up town was actually the center of Seaside. 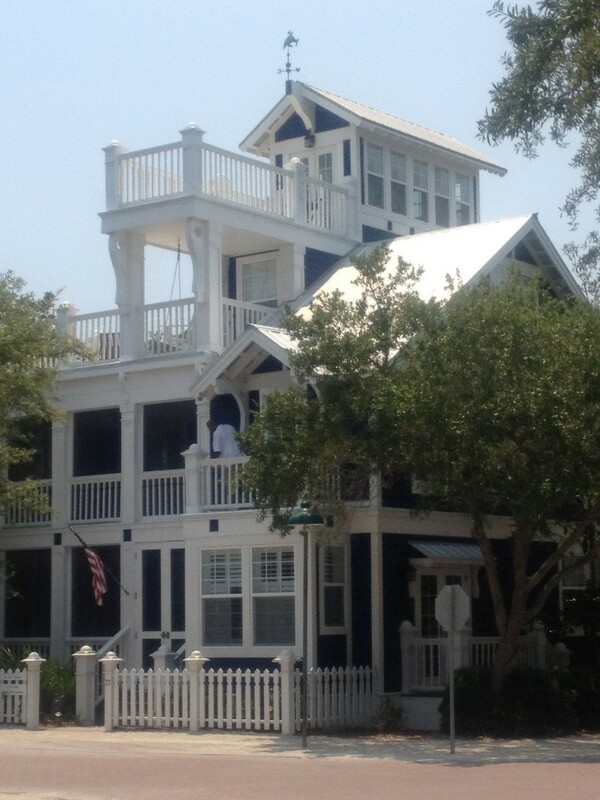 I love the houses here…but owning one? Forget about it! The town is very beautiful. 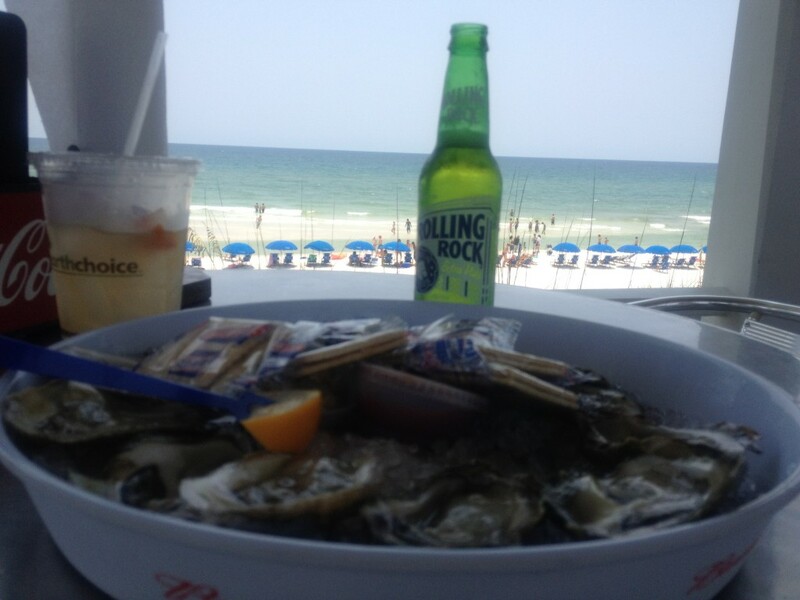 Dave and I parked the car and enjoyed a seafood lunch right on the beach. 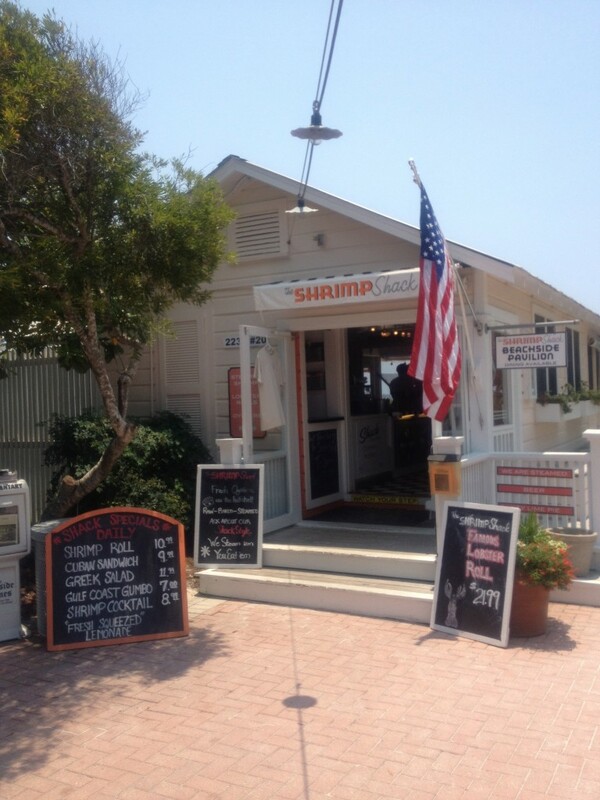 This is the Shrimp Shack’s seating area. Beautiful! My lunch…and my view during lunch. This was so nice! After walking around the center of the town, exploring a toy store, a gourmet grocery store and a fudge/ice cream shop, we walked up and down several of the streets with residences on them. While at first we thought the houses were seasonal homes, such as what we saw on North Carolina beaches, we noticed housekeeping vans in front of several homes…with “Cottage Rental Agency” on the vans. OH! 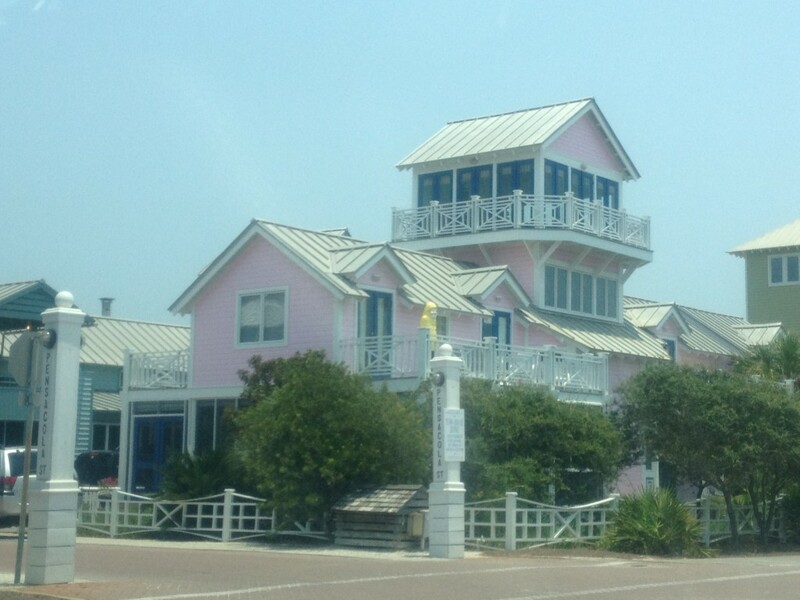 They’re vacation RENTAL houses! Wow! 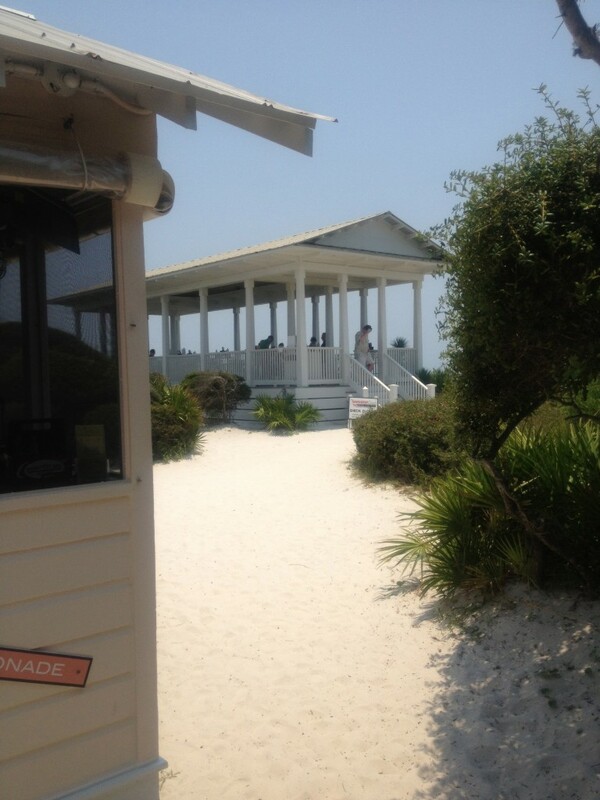 Dave and I found the check-in area for those houses and got a brochure for renting the houses. Um…yeah. I don’t think we’ll be doing this for a while. While it’d be fantastic for several families together to rent one house (we saw a truck pull up to a house and there were two families uniting for a vacation…apparently the families hadn’t seen each other for a while, judging from the “Wow, the kids have grown!”-type comments)…this town is incredibly luxurious and we will simply have to admire the town as a passing fancy for now. 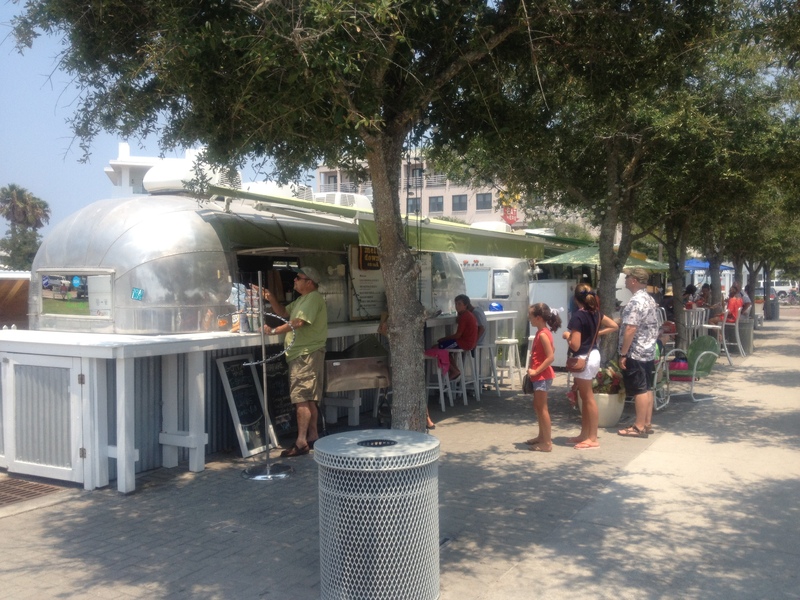 On 30A through the center of Seaside is a row of Airstream trailers: gourmet food stands! They were very neat! Love these Airstream food stands. This is a grilled-cheese sandwich stand! How cool is that? 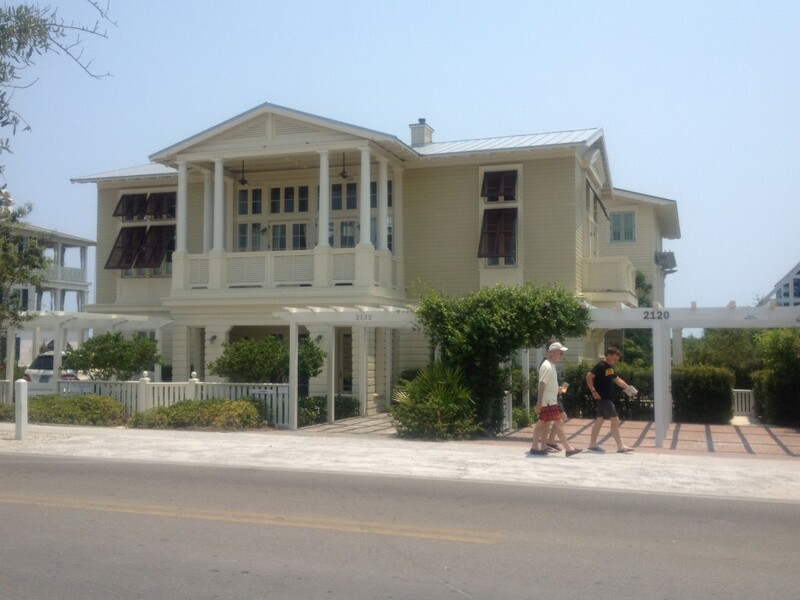 We continued our eastward drive through the towns of Seagrove, Alys Beach and Rosemary Beach. These towns were similarly beautifully groomed. 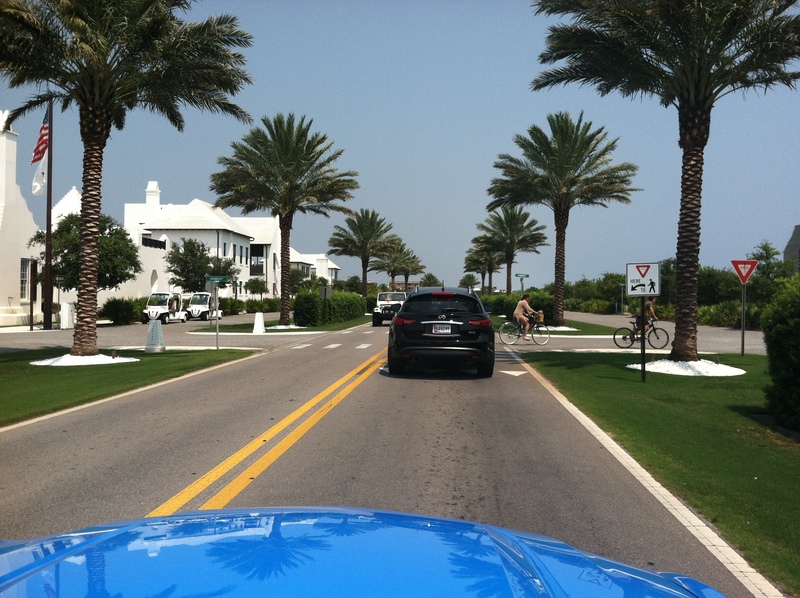 Here’s our picture of Alys Beach, which reminded me of those classic scenes of the tall palm trees in Beverly Hills. Highway 30A reunites with U.S. 98 just west of Panama City Beach, and we took state route 30 along the beach road in Bay County all the way to Pier Park, which is a shopping mall, amusement park and entertainment complex just north of the Panama City Beach pier. 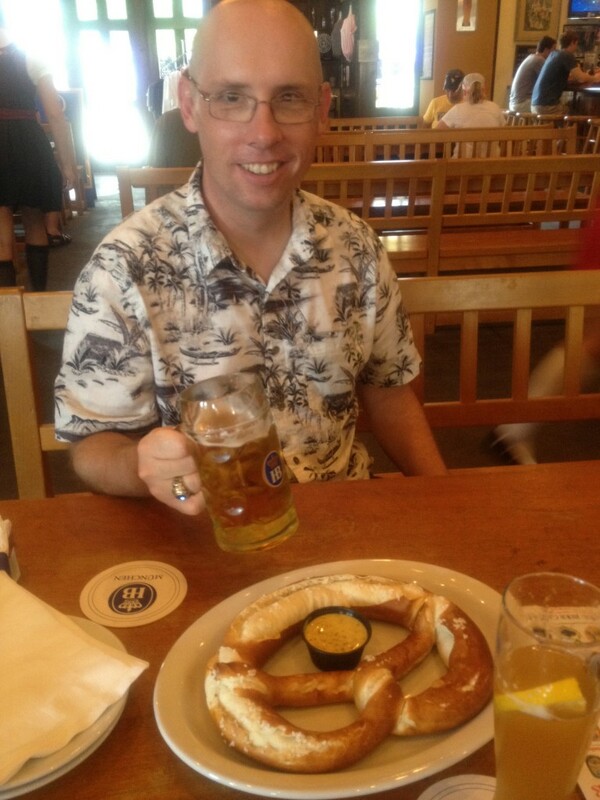 We enjoyed beers and a giant pretzel at the Hofbrau Bier Garten, which we didn’t know existed. 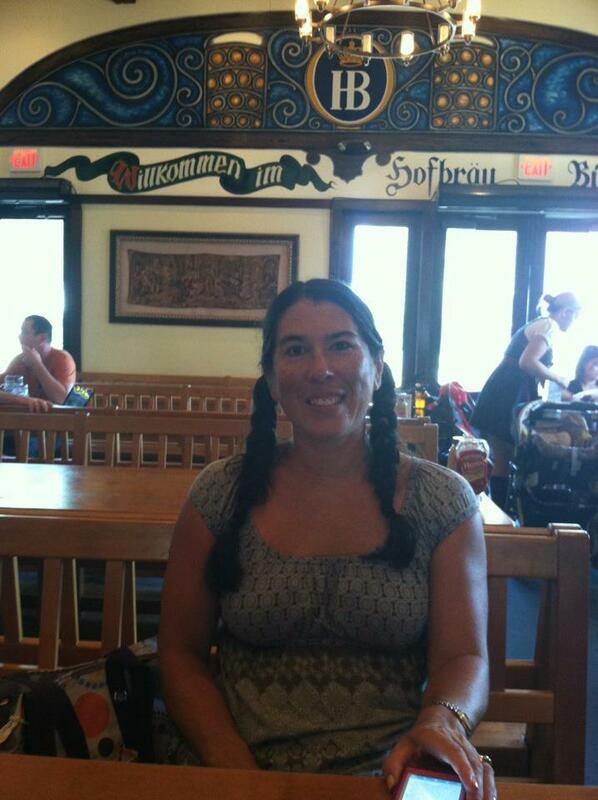 This is my “spending the day in a convertible” hairdo!